At times truly bizarre expressions of timeless truths manifest in a profane cacophony of infernal wayward theosophy that pretends to lead to some form of gnosis or knowledge. 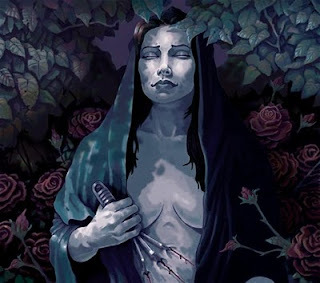 One such expression concerns itself with a ‘wiccan’ perspective on Lilith where she is seen as a Mother, equal to any other goddesses, which all are mothers. The generic ‘Mother’ is in need for some clarification. The metaphysical idea inherent in motherhood is clearly related to the womb. Mother will therefore in its fundamental premise which makes it possible be a reference to the possession of a womb. As such nature is the prime manifestation of the divine possibility. She is the womb of the world that makes life possible. If we accept this as a satisfactory premise for someone to be referred to as a Mother we will also be challenged by the womb fertile and barren. It is here we can approximate Lilith by her essence being defined by absence. She is the holy dove unfolding in the ebb and flow of the Moon. She rides the waves of nightmilk as the Blood Queen of impregnating inspiration by virtue of absence. Because of this she is the terror of night, not silence, but the absence of sound, when feelings of isolation and loneliness cling to the throat. Because of this she is for many seen as the Mother of witches, and with witches we must understand the one who lives at the threshold of the worlds and embalms the world in poetry and charms. There is no room for ‘urban paganism’ in her mystery, she lives in the wild where the absence of sun and heat is poignant – and this is the bloodied road for the race set apart to affirm the divine design. We can notice her manifestations not only in the sensation of terror but also where lust and violence join hands and we are driven over the edge of safety. There she is waiting at the port that knows no safety, but the hooks and chains that caress your flesh and drive you out in a state of tension and divine ecstasy where the body itself turns into the instrument of night. The body becomes absence manifest.